VEGAS: The 2019 National Season will kick off like usual, at the Short Track Capital of the World; the South Point Hotel, Casino and Arena. BMX short-track racing is super exciting to watch, as there's a ton of action in every turn - and the South Point is the perfect place for good times. Inside the hotel and casino is everything the family needs - games, movies and bowling for the kids, and clubs and gambling for the adults ...not to mention, the awesome pool facility. (Hint: Be sure to catch the Spazmatics on Saturday night!). Race-wise, there's a huge warm-up area (arena), and your pits can be Rental Stalls (for a fee) to store your bikes and gear overnight. You definitely don't want to miss out on the first National of the year - especially since it's a 3-Day'er. LOUISVILLE: Stop No.2 of the USA BMX series drops again in Louisville, at the KEC Arena. It's super convenient, located just across the freeway from the airport. (So close, we've seen people ride their bikes from the airport to the hotel - but we recommend a shuttle.) The arena is ideal for a BMX event and even has enclosed, furnished VIP Lounges up for rent, all around the arena, with great views from the track. 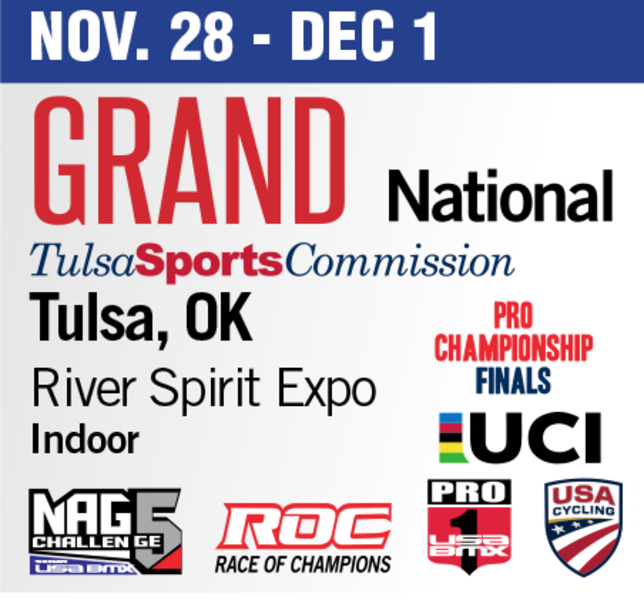 TULSA: The second month starts off with the third National event, and for those who didn't get their fill of Tulsa back in November - USA BMX is thrilled to return to the City that Loves BMX Racing: T-Town. The Ford Truck Arean is located right across the parking lot from the Grands location, and the track is always a great one (utilizing the Grands dirt). Extra Special for this year is the fact that Tulsa's a 3-Day National, and will hold the honor of hosting the annual Presidents Cup. Special prizes will go out toward the individual "overall" winners from the three days, as well as the race between State -vs- State. PHOENIX: Stop No.4 on the USA BMX circuit comes to our company's hometown, for the first outdoor National of the year - Black Mountain BMX in North Phoenix. With a ton of room for RV parking and camping, many BMX families flock to the Phoenix race, for its great racing and always awesome track. Longtime track operator Debbi Kelly and her crew really know how to put on a show and everybody leaves the Valley of the Sun happy. This is also the kick-off for the 2019 Pro Series, so with UCI points on the line for Olympic country qualification, you can expect the who's-who of International BMX to be present. 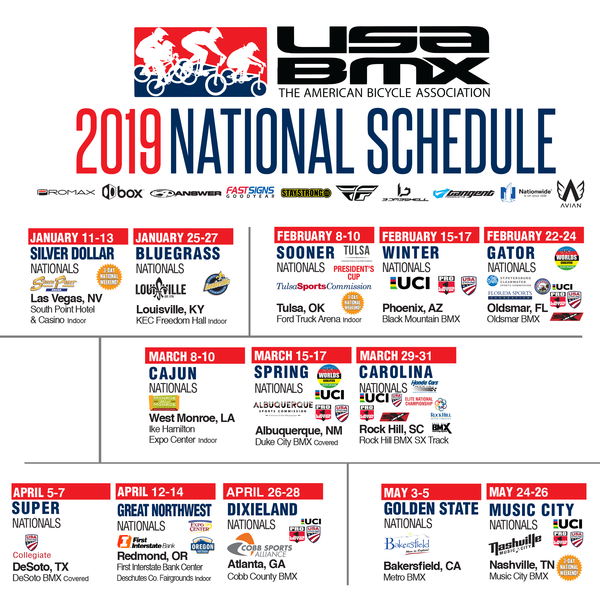 OLDSMAR: The following week is another Pro Series race, and for the first time in 2019 - USA BMX will take the Pros to the big Olympic-sized starting grid of Oldsmar BMX in Florida. Stop No.5 in the series will bring the BMX world to the Sunshine State, right outside of Tampa, FL. Mayor Beavus and his City are always proud to host the BMX families and riders to their bright city, which has a ton of great restaurants and plenty to see. Racing at Oldsmar is always awesome, with a challenging dual-hill track and gigantic asphalt turns, making this one of the best races of the year. Oldsmar is also excited to host the first of two UCI Worlds qualifiers - held on Friday, to see who qualifies to be on #TeamUSA for 2019 (*The UCI Worlds are being held in Zolder, Belgium for 2019) - so expect to see some great battles for those limited spots. WEST MONROE: Stop No.6 on the USA BMX national series returns to Cajun Country; and one of the most fun indoor tracks we ever build. Last year, track builder Billy Allen and his boys got creative with the corkscrew loopty-doop first turn (utilizing a cross-over section), and we can't wait to see what he has in store for us at the Ike Hamilton Expo Center. This is a super fun national to attend, as hotels are super close-by (right across the parking lot) and the legendary Duck Commander HQ (as seen on their hit TV series Duck Dynasty) is just a mile down the road. ALBUQUERQUE: Next up in March will be the highest elevated race of the year; in Albuquerque, New Mexico. The Spring Nationals tradition returns to Duke City BMX, and this year will again be a Pro Series stop. In 2018, the pros really put on a show in ABQ, with some all-out battles and amazing action thru Albuquerque's Pro section. 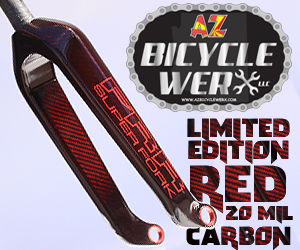 Also at stake is the second and final chance to qualify for #TeamUSA; to earn an invite to the UCI Worlds in Zolder, Belgium. ROCK HILL: On the last weekend of March, timed perfect for many riders Spring Break, we are pleased to bring you the Carolina Nationals in Rock Hill, South Carolina - previous host track of the UCI Worlds. If you've never been to the Rock Hill's multi-million dollar facility, you will be blown away by the venue. It's easily one of the finest BMX facilities in the country. With its double-hill layout, mondo berms, grassy in and outfield, plush grandstands and large/clean restrooms, riders and parents love coming to this race. Better yet, this year will mark the return of the USA Cycling Elite National Championships - which will play a part in the Olympic qualifying process for #TeamUSA and could be a factor in who gets to compete in the 2020 Tokyo Olympic games. REDMOND: Following Texas, the BMX gang heads to the Northwest - and the always-awesome First Interstate Bank Center in Redmond. The arena is perfect, the dirt is ideal and the seating is plush and comfy. Not a bad seat in the house! This is one of the staff's all-time favorite Indoors of the year, and we hope to see you there on April 12-14 for the Great Northwest Nationals. ATLANTA: Toward the end of April, the USA BMX circuit heads back outdoors for good (well, until #V2 in July), as we head to Cobb County BMX. This will be the third year we've raced on this fairly-new track, and the Pros will be returning to take on their big Pro section and put on a show for the fans. 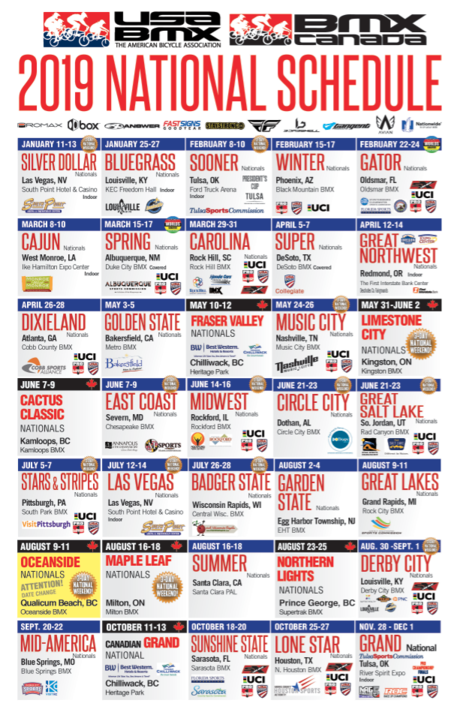 We can't wait for the Dixieland Nationals - April 26-28th. COMING MAY 2019 >> Five months into the new year and we've got two stops in May for you. By this time of the year, every BMX track across the county has thawed out and there are plenty of local, State and Gold Cup races to hit up. But for those wanting to hit the National circuit and take on the very best our sport has to offer, we've got two great venues for you. BAKERSFIELD: At the beginning of May, we head to centrally-located Bakersfield, California. With such major improvements to this facility over the past few years, we'll return for the third year in a row to the smooth, concrete turns of Metro BMX. As home to plenty of top-notch Factory riders and major teams, the talent runs deep in Bako, and the racing will be big-time. 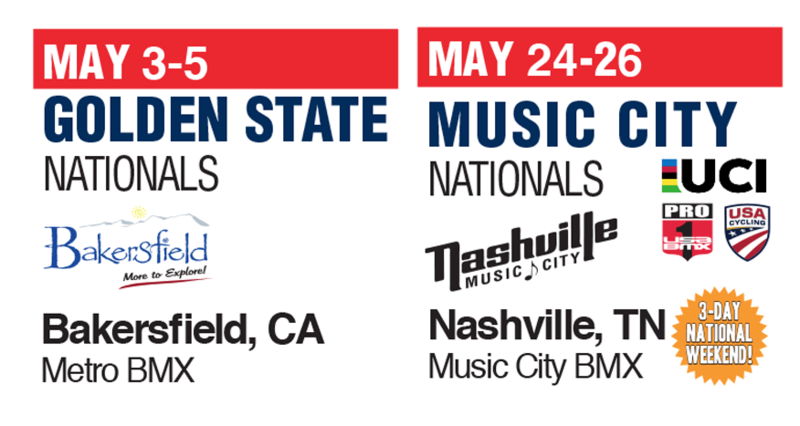 NASHVILLE: For Memorial Day weekend, the 2019 series returns to its home in Nashville, Tennessee for the Music City Nationals. 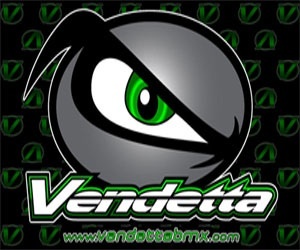 This track consistently ranks in the Top 1 or 2 of every top rider's pick for Best Track Ever. It's fast, it's fun and the competition is always fierce. Located in a State Park, just hundreds of feet from a lake, it's a great venue to camp out at, and the "Heart" of Nashville is closeby (including the Opry - only 21 min away). Being a three-day National, on a three-day weekend, be sure to take in the many sights of Nashville on Monday before you head home. SEVERN: Maryland's Chesapeake BMX is located close to the Baltimore airport, and is one of the finest facilities on the East Coast. The track has spawned many top National-caliber riders, and there's a good reason for it - this venue is incredible! The track is super smooth, with a soil-tac'ed surface and plenty of challenging obstacles. Maybe if we're lucky, there might even be a Travis Pastrana sighting during the weekend. And if you're planning to make your summer vacation around this race, our Nation's capital is just a short train ride away from Severn, MD - with multiple sight-seeing locations and FREE museums to take in. Rental bikes in Washington DC are an ideal way to get around the area. ROCKFORD: The Rock rocks. 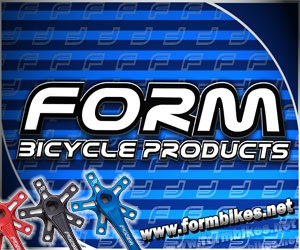 Illinois' Rockford BMX venue is one of the longest standing stops on the USA BMX circuit, having hosted the MidWest nats since the mid-80's. From its tree-lined parkk setting - filled with campers and motorhomes, to its covered staging area and soil-tac'ed track surface and wide array of jumps inbetween highly carvable paved turns, this race has the potential to have the most fun you've ever had at a BMX race. For you old-schoolers, don't forget that Rockford is always the home to the traditional Vintage BMX show, so be sure to bring your collcter BMX bikes from past and mid-school. DOTHAN: The Circle City BMX track is famous for being fun; and especially for its cross-over section. You might say that they put the "X" in BMX. Located in the center bowl of a city park, there's great spectating from anywhere around the track - and the Alabama BMXers know how to put on a show! SO. JORDAN: Rad Canyon BMX is another longtime tradition on the National circuit - and for a good reason. Utah's top track is fast and challenging, with paved turns and a rhythm-filled last straightaway that makes for exciting finishes. With large bleachers on both side of the track, and a ton of fun extra curricular activities to do between Salt Lake City and nearby Park City, this could be a fun-filled vacation for the entire family. SOUTH PARK: Who's ready to return to the legendary South Park BMX track?! Many in the BMX world are stoked to see the incredibly fast, slightly-downhill South Park track back on the schedule for 2019 - and being 4th of July weekend - there's no better time to make a Pittsburgh vacation out of the trip. LAS VEGAS: Short-track BMX at the South Point is so high on the fun-factor, that USA BMX has again decided to do it twice in a year. The second-stop in 'Vegas will see a different and unique course built inside the plush and comfy South Point arena. With hundreds of stalls used for rider pits, and everything you need under the large confides of South Point Hotel & Casino, this event is always a ton of fun for the entire family! WISCONSIN RAPIDS: Located under the shadow of Wisconsin Rapid's water tower, the super impresive Central Wisconsin BMX facilty has hosted their fair share of USA BMX Nationals and Gold Cup Finals. This year, stop 20 on the national circuit returns to the radical soil-tac'ed track in the Badger State. It'll be loads of fun - and brought to us by the Visit Wisconsin CVB. While you're in town, there's plenty to do - and be sure to pick up some fresh cranberries! EGG HARBOR: For the first time ever, USA BMX is stopping at New Jersey's legendary Egg Harbor venue. For decades now, Egg Harbor has been known for running it's annual Jack Frosty Classic (which draws a National-like turnout). Also in the past, they'd hosted their share of NBL nationals - and finally, much to the delight of East Coast riders - the USA BMX tour will come to town. This is sure to be one of the most anticipated national series. GRAND RAPIDS: Another first-time stop for the USA BMX tour this summer is Michigan's Rock City BMX track - ran by the Salisbury family and their crew of wonderful volunteers. The entire BMX world is rejoicing over the return of holding a national in the great state of Michigan. We hope to see you all in the Grand Rapids area, in mid-August. SANTA CLARA: The Summer Nationals return to the BMX-mecca of Nor.Cal. ; only this year we will be stopping off at the all-new and recently improved Santa Clara PAL track. After showing the BMX world how good their program is - as one of the country's Top Tracks and host of the Nor.Cal. State Championships - USA BMX knew that they more than deserved to get a spot on the National schedule. With an awesome facility, including a great track and plenty of room for parking and pits, Santa Clara will be an incredible place to hold Stop #23 of the USA BMX series. 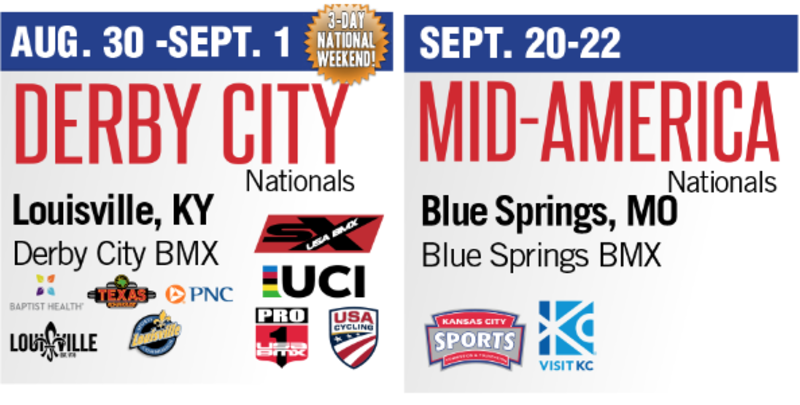 LOUISVILLE: Labor Day in Louisville is a longtime BMX tradition - and it continues in 2019, as all of the top racers in North America converge on the outdoor Derby City BMX facility, located at EP Tom Sawyer State Park. Whether you want to stay in one of the many nearby hotels, or camp out track-side in a RV or tent, Louisville's got it all. The Derby City track is among the top-3 favorite stops on the entire National circuit - and the dual-hill course never disapoints when it comes to the racing action and the fun and thrills of riding on it. 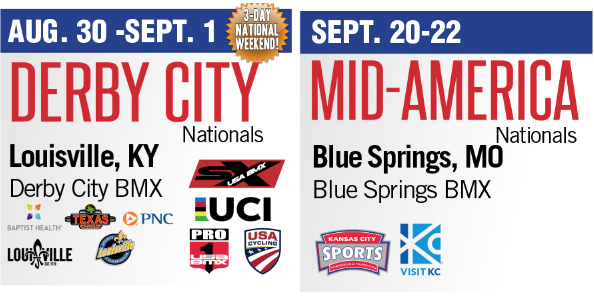 BLUE SPRINGS: Kansas City Sports is pleased to bring the BMX world back to the Kansas City area - . SARASOTA: Last year was the first time the national circuit had stopped in Sarasota for a national; and we are thrilled to return again in 2019. With an awesome dual-hill track, located in a green and grassy park setting, Sarasota BMX is one of the most plush places for a big BMX event. As the season winds down, this PRO series race will play a big factor in the UCI Country points chase - and will be vital in determining which Countries will get the most riders heading into the 2020 Tokyo Olympic games. And by the time of the year, the Pro title chases for the No.1 plate will be highly contested, as The Grands draws near. HOUSTON: This will be the first major USA BMX event at the brand new Houston BMX complex - and since it will be playing host next year to the UCI BMX World Championships, the 27th and final stop of the regular series is bound to be a hot one! Riders from all over the World are expected to attend, in order to get a leg-up on the competition in anticipation of the up-coming Worlds. This is also the final Pro series stop, and will see the World's fastest Elite and Juniors hitting mach-speeds off of the big hill. We hope to see you in Houston for the last-chance in the National points chase. TULSA: It's called the #GreatestRaceonEarth for a good reason - the USA BMX Grands is the largest and most exciting BMX event in our sport. The most motos, the most vendors and teams, and the most riders, with National and NAG titles all up for grabs, the Grands is the ultimate BMX experience. The track is always top-notch, the vendor and pit area spans 3/4 of a mile long, and the racing is the most intense it will ever be all year. Over four-days, The Grands kicks off on Thursday with all-day practice, then the Invite-only Race of Champions kicks off the racing on Friday. To get a ROC invite, you need to compete in the State Series and place high enough to qualify. Up for grabs at the ROC is the red-background ROC #1 plate, to all winners. Then the action really heats up beginning on Saturday. with the first round of motos - followed soon after by the ticketed Pro Championship Finals. The three National No.1 Pro titles are decided during the two hour show, which always guarantees some of the best racing of the year, with the NAG-5 Challenge sprinkled inbetween the Pro title chases. It's the best show in BMX! Then comes Sunday - starting off with the 2nd round of motos and quickly narrowing down the field thru 16ths, 8ths, quarters and semi's - until we've got the fastest eight riders in each age group. By the end of the night, six more National No.1 titles will be decided for amateurs and teams.